In the next year or so, he will lose the ability to walk, speak, swallow and then breathe. This disease will slowly kill him and he knows it, but at 54, Neale is determined to go down fighting. He knows that he will die soon, but he is using his last months to raise awareness and much needed funding for medical research that he will never benefit from. He could curl up and feel sorry for himself and who could blame him? But instead he is using his profile and connections to make a difference in the world. And even with a death sentence hanging over his head, he has a vision for his life. Thanks Neale for your passion and resilience in the face of an awful situation and for reminding us that we don’t need to be defined by our circumstances, but by our response. I’ve seen the impact of this disease on a family. My kids go to school with 2 children who lost their dad just a few months ago to MND and it has been a terrible time for them. 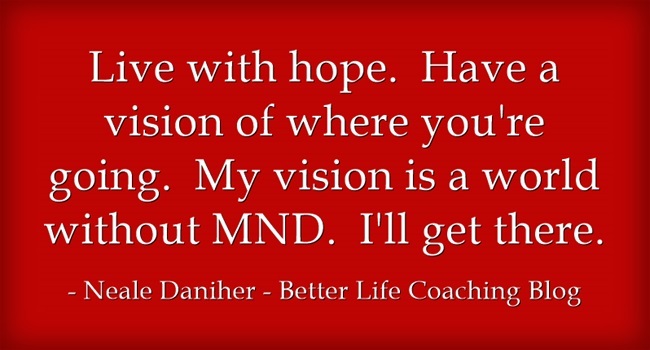 Sadly, 2 Australians are diagnosed with MND every day (with many more around the world). If you would like to learn more about this disease and donate to medical research, feel free to check out this site dedicated to freezing MND.